I don’t know if it’s just me but during the time when you are waiting for Spring to come and Winter seems to drag on forever – I tend to get lazy and crave comfort food all the time. Luckily egg drop soup only takes 10-15 minutes to whip up! 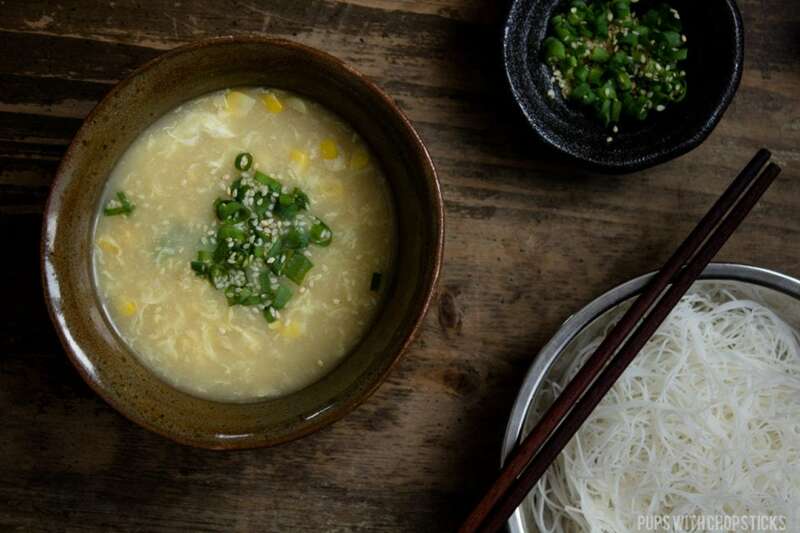 This soup is not your usual traditional egg drop soup. 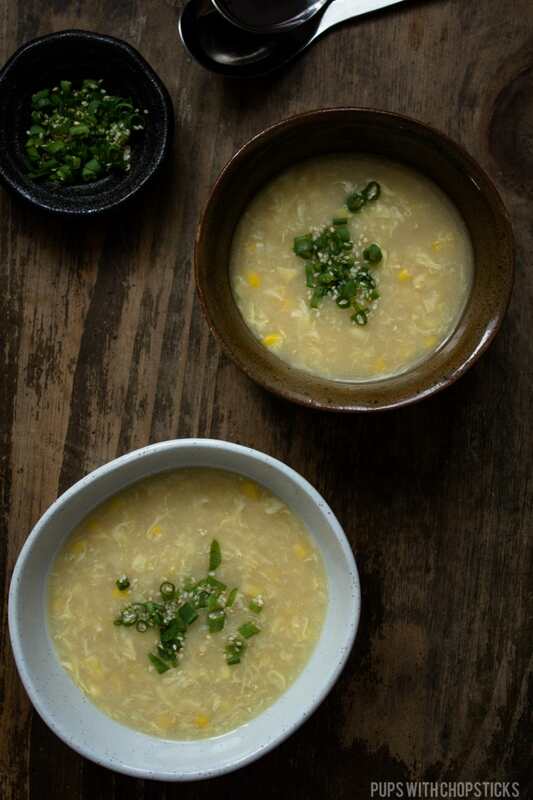 This miso corn egg drop soup has the addition of miso for the added depth in flavour and umaminess and bits of corn to give a burst of sweetness to each sip, and of course the essential egg ribbons that make the soup pure comfort – excellent for days you crave comfort foods. 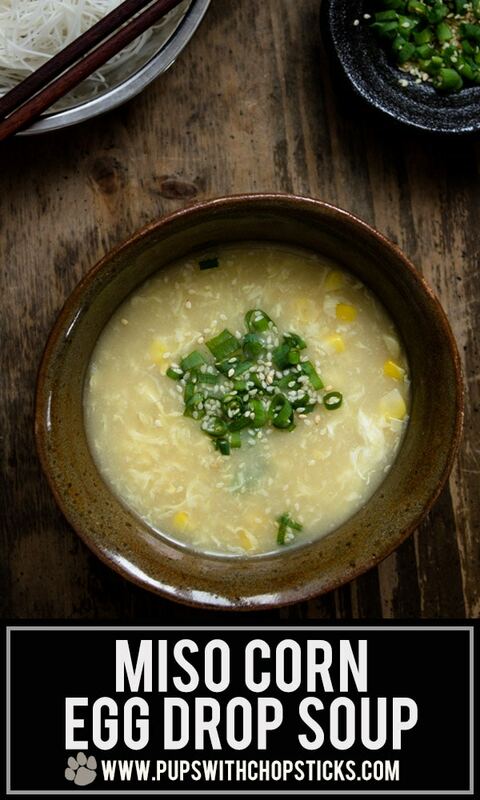 For this Miso Corn Egg Drop Soup recipe, you can find all ingredients at your local grocery store. Try to find a good quality broth with low sodium or no sodium for this recipe so you can control how much salt you are putting into the soup so you can tweak it to your liking on how salty you want this soup to be. This is pretty much a one pot recipe, where you can throw everything in (except the egg) at the same time. 🙂 So there’s nothing to it. How Do I Get Those ‘Egg Ribbons’ In My Soup? 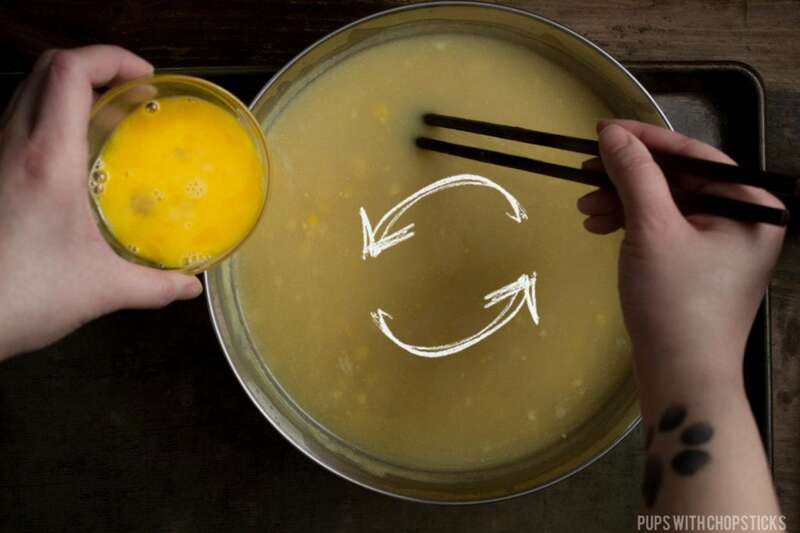 Stir Your Soup in One Direction Only – Stir your soup in one direction to start a whirlwind momentum before adding in the whisked egg. Continue to stir the soup in the same one direction gently and slowly to stretch out the strands of eggs. The heat from the soup will set the eggs as it stretches out in the soup. Turn Off the Stove Before You Add the Egg and Stir it Slowly – I like to do this right after the soup has come to a boil and thickened (so the soup is super hot). The reason I turn the stove off before I add the egg is because I find that whenever you have the stove on, it continues to boil which disrupts the one direction flow the egg is being cooked it. There’s nothing wrong with that, but sometimes it ends up curdling the egg and not creating the ribbons. It’s also essential you are mixing it slowly and gently. If you mix it too quickly it will not have a chance to cook into the ribbons and it would make the soup more custard-like. In a small pot, add in the ginger slices, miso, broth and corn and set the stove to medium heat and let it simmer for 10-15 minutes. 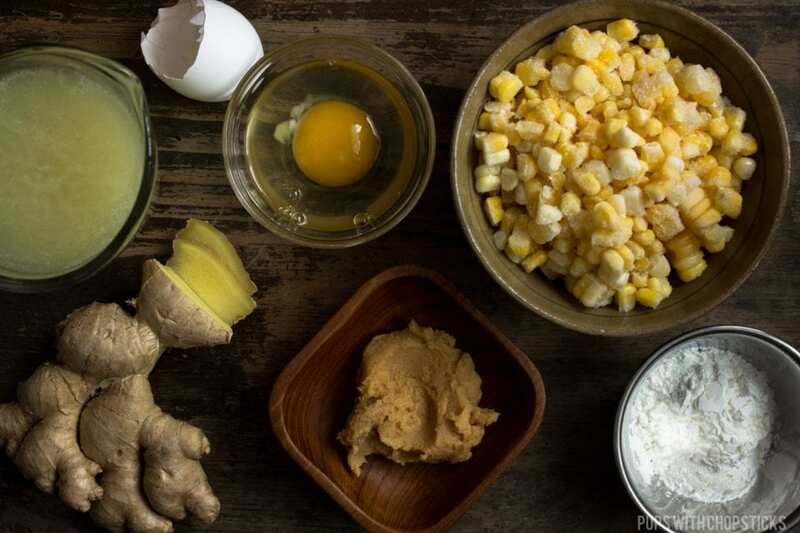 In the same bowl you used to make the corn starch slurry (less dishes! ), beat 2 eggs with a fork until they are well mixed. Once the soup has come to a boil again, stir the soup in 1 direction a few times to create a whirlwind effect and turn off the heat and slowly add the egg mixture in while continuing to stir. Keep stirring in the same direction slowly for 1 minute until you see egg ribbons and the eggs are cooked. So happy you liked it! 🙂 It’s definitely one of my favorite soups during this cold season. I’m very happy I could share this! This really looks so perfect and inspiring. I dont do a whole lot of Asian cooking. But I love miso soup and when I want to make it this is where I will come. I love the detailed instructions and pictures. 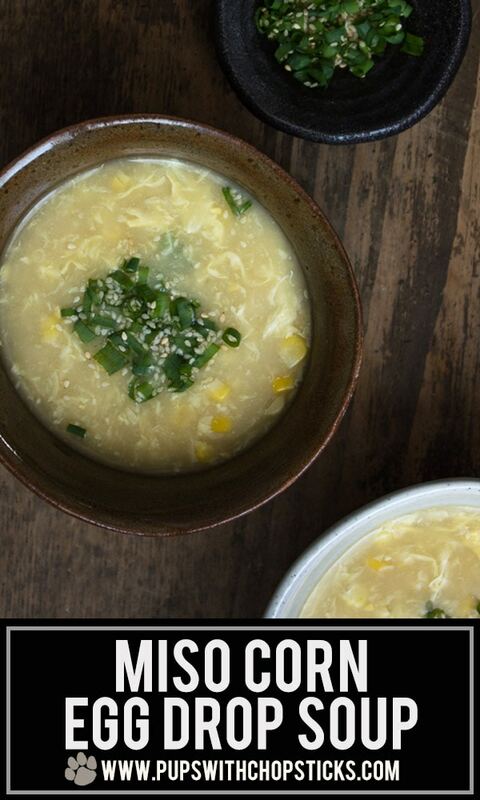 i love this simple Miso Corn Egg Drop Soup, I have the Miso being kept in fridge. Chop some gingers into this soup is new to me. But kids like it, by adding some vermicelli noodles in to eat, especially after school, quick cooked. 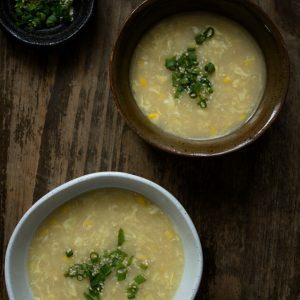 I LOVE the addition of the miso and corn to this, so unique and smart! 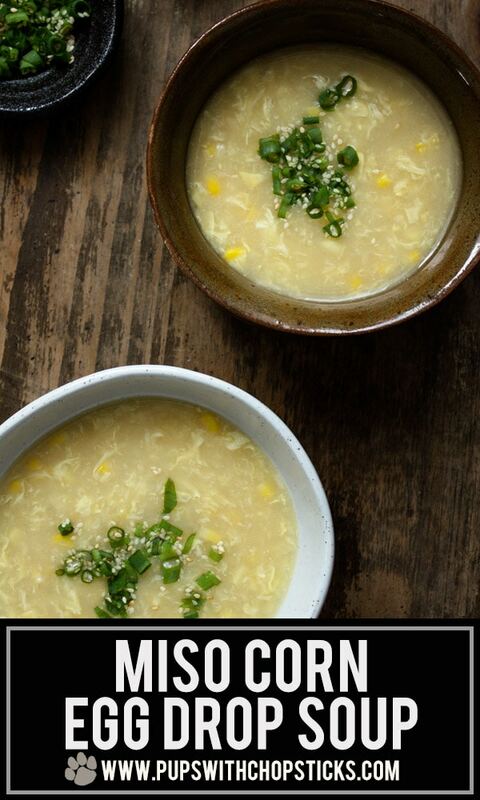 I’ve never tried making egg drop soup before, but your stellar instructions have me feeling like I can easily pull it off now 😀 And your tip about buying a bunch of fresh corn in the summer, then freezing the kernels for use in the winter – that is pure GENIUS! Definitely doing that from here on out! i’ve been making something like this a lot recently! mostly because i’m in a soup mood, and i’m too lazy to pull out another pan to scramble eggs lol. but yours sounds better because (in keeping with the lazy pattern) i’m using some random storebought miso ginger broth, which doesn’t really taste like fresh ginger or real miso. 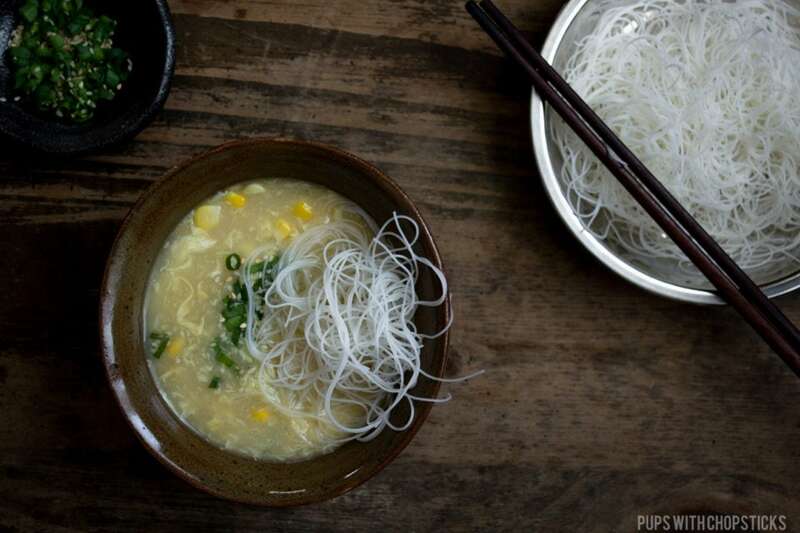 Egg drop soup is absolutely one of my favourites, adding Miso must make it even more amazing! What a fun, simple and delicious idea. I love how few ingredients you’re using in this simple soup. Makes it really approachable on a busy week night. Thanks for the recipe inspiration! This soup looks very delicious! Egg drop soup is one of my favorite quick and easy meals… though I never thought to make it with miso. I am so excited to try this soup!!! 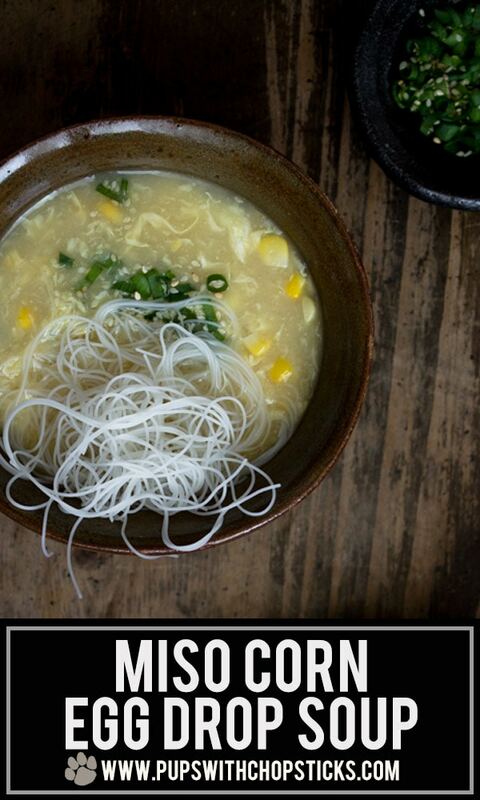 What a delicious Miso Egg Drop Soup! I simply cannot wait to try it! Very interesting combination of ingredients. I am saving this recipe for later.